Skewerz Kebabz Celebrates Double Digits! Perth’s love affair for Mediterranean cuisine continues with the opening of Skewerz Kebabz in Ocean Keys Shopping Centre earlier this month. The store is the eighth in Western Australia and the 10th location nationally for the kebab brand. Customers were treated to free chips on opening day and $5 vouchers were awarded to the first 1,000 customers to the counter as part of the launch. Kylie Mishra, CEO of franchisor Aktiv Brands, credits the brand’s success to the menus broad appeal and use of fresh ingredients. 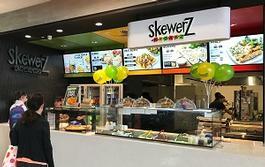 “Skewerz isn’t your average kebab shop,” said Kylie. “We’re always challenging ourselves to find ways to elevate the ‘kebab’ experience, from fresh quality ingredients to really exciting menu innovations,” she said. The Ocean Keys outlet has adopted the same new menu launched at Mandurah Forum earlier this year. “The menu has been developed to increase market share in periods outside of lunch trade with additional time of day segments such as coffee and traditional Turkish sweets. This is already proving to be a hit with customers,” she said. Perth remains a focus of growth for franchisor, Aktiv Brands, with eight shopping centres now housing both Skewerz Kebabz and Bucking Bull outlets in the same food court. “There’s a lot of changes happening in the Perth retail landscape, which has resulted in increased opportunities for casual dining models of both brands,” she said. Skewerz Kebabz Ocean Keys opened on Tuesday 4th September and is located in the food court at Ocean Keys Shopping Centre, 36 Ocean Keys Blvd, Clarkson WA 6030.